The Cuisinart 7117-16UR roasting pan is a perfect solution for everyday family meals, parties and holiday celebrations. This roasting pan is designed to hold turkeys, chickens, and large roasts. 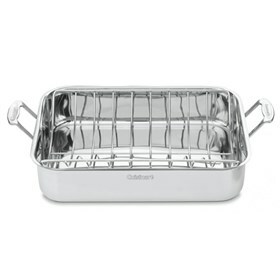 It features solid stainless steel rackwhich allows heat to circulate and let meat or poultry drain as it cooks. The pan has riveted stainless handles which allows it placing into the oven and lifting from oven easy and safe. The 16 Rectangular Roaster W/Rack Chef Classic Stainless has many exciting features for users of all types. See the 16 Rectangular Roaster W/Rack Chef Classic Stainless gallery images above for more product views. The 16 Rectangular Roaster W/Rack Chef Classic Stainless is sold as a Brand New Unopened Item.